Supreme Master Ching Hai's "Ocean of Love Tour" flowed like a global current from New Zealand, in the Southern Hemisphere, gradually upward into the Northern Hemisphere. The Tour was warmly welcomed along the way by tens of thousands of people, and ultimately reached Seoul, capital of the highly spiritual country of South Korea. Master's final lecture on the Tour was held at the COEX (Convention and Exhibition) Center, a brand-new facility in downtown Seoul. As Master's lecture was the first event to take place there, it seemed that God had especially arranged it to be the grand opening ceremony for the new COEX Center. The new hall is large and spacious, and easily accommodates 10,000 audience members. Long, colorful banners, decorated with galaxies, the moon, and stars in sparkling silver and gold colors set a brilliant background for the raised stage where Master spoke. An elegant white lotus was gracefully wrapped around Her seat, with two smaller white lotuses at either side. Surrounding the stage were images of floating white clouds. 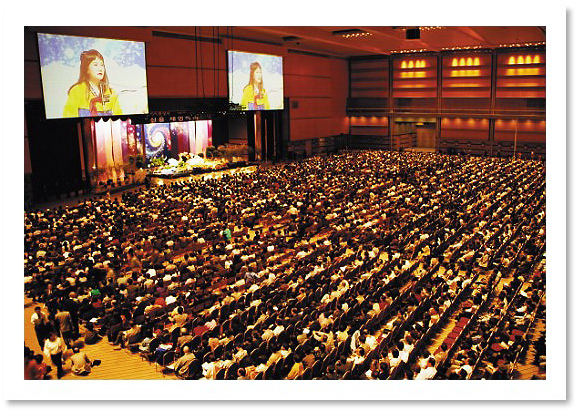 On the day of the lecture, people began entering the Convention Center early in the afternoon, and the lecture hall was soon filled. A welcoming team in traditional Korean dress could be seen lining the way from the first floor entrance to the third floor where the lecture hall is located. Thousands of Korean-language copies of The Supreme Master Ching Hai News magazine had also been prepared for distribution, and every copy was taken before the lecture began. 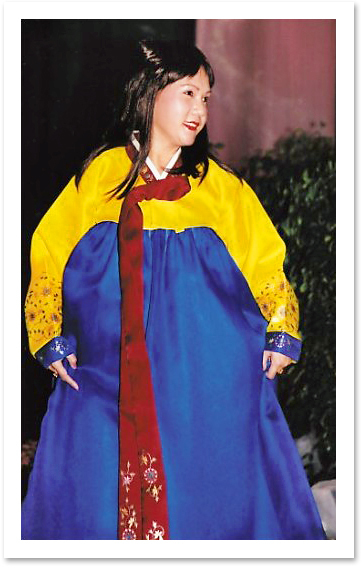 In the evening, Master arrived wearing a beautiful blue, yellow, and red "hanbok", the traditional woman's dress of Korea. 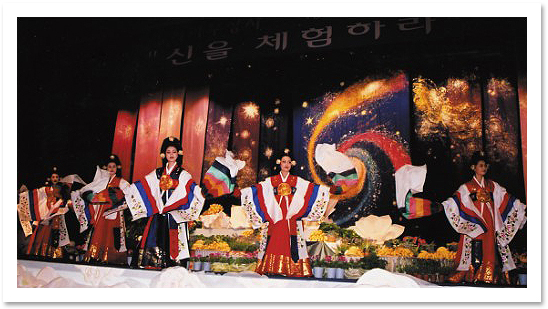 Before Master spoke, a group of lovely female dancers performed a traditional Korean dance. After a fruit and flower offering, Master led the audience in a silent, sincere prayer for Korea (North and South) and for world peace. A traditional Korean dance brings memories of Heaven. In Her speech, Master said, "We have all heard from the Buddha that Buddha's Land is right here, and you can find it within yourself. We have all read in the Bible that the Kingdom of God is at hand: 'Lo and behold, the Kingdom of God is at hand. The Kingdom of God is within you.' But we just read it, and do not even have time to think about how to find it. If it exists, we must be able to find it. Yes, we can!" Master elevates everyone to the true World, which is forever in perfection. "Suppose I'm beautiful, and when I look into the mirror, I think that I'm beautiful, but even then, this beautiful image is just a reflection of myself. If I continue looking in the mirror all the time, and feeling 'Oh, my God! Who's that in the mirror? She is so beautiful.' I will never remember this real world. That's what it is." "I can enjoy the image in the mirror, but I should also know that I, myself, outside, am real, even more beautiful, more real, and everything is more useful than in the mirror. Similarly, there are two worlds: the one outside that we see here, and the one inside. And once we close our eyes and know where to look, we'll see the other world, which is the same simultaneously, which is the real one, which is more beautiful, more splendid, happier, more everlasting, and will make us so satisfied, so contented that it doesn't matter what the influence of the outside world is. Afterwards, we will not feel the effects, but we'll always feel happy because we know the Real Thing." "Suppose this mirror is fine now, but sometimes something happens, and it gets broken; and when I look in the broken mirror, I see my face all broken, and I feel like crying, 'Oh my God, do I look so ugly?' because I concentrate on the mirror; but once I forget the mirror and look at myself, I say, 'Oh, I'm still okay. My face is not broken; I'm not wounded anywhere. I look beautiful.' That is what we should do with this world and with ourselves. We should look back into the reality and find everything in perfection, as always. Since time immemorial, we continue forever in perfection. Then it doesn't matter how broken this world outside is, it's just like the mirror, and we won't worry." "That's how the enlightened saints are -- forever happy and content in any situation, in any circumstances. Whether they have a lot of possessions or have no possessions, they are always happy because they know their True Selves, they know the true world, which is all glory, all splendor, all blessing, all happiness. The brightness of the inside world is ten thousand times brighter than our sun, in some of the worlds, and the diamonds, stones, and precious gems here, when compared to the diamonds, stones and gems in the inside world, look like dirt, like sand. They are useless and have no power, no vibration, and no loving response. The things in the real world have souls -- they can correspond with you. Even a table can talk to you; the trees will sing for you; the birds understand your language, and you understand them; and all the things, the gems, everything, the clouds even, understand you; and the clouds transport you everywhere without you even saying anything." "That's why, when we have found our true world within ourselves, which we call the Kingdom of God, the Buddha Land, or the God Nature, we are contented, we are consoled, we feel no longer lonely, we feel no longer insecure, we feel no longer afraid of death or any disaster of any kind, because we know that we will never die. We know that there is a world which is billions of times more magnificent than this world of ours, so we are not afraid to lose anything, we are not even afraid to lose the whole world, any possession, or anything that was so-called 'very dear to us' before enlightenment." "But we don't have to forsake anything in the world, we don't have to throw away everything in this world, and we don't have to become a careless person or a very sloppy person in order to show our enlightenment, or think that an enlightened person would like to make himself anything different than worldly people just to show that he doesn't care. He continues to live his very ordinary way of life. He continues to integrate himself with all his brothers and sisters. He does so even more, because now he knows he is one with all beings." Master continued, "I've gone to many different countries, and some countries are very, very developed in technology and science, but are not too developed in the inherited wisdom within us, in spiritual understanding. And those countries seem very, very dry; so dry that even if you brought the Buddha and placed Him in front of their faces, they would not want to know about Him. Our world has developed very speedily in the last century, in technology and science and many aspects. It behooves us to also develop spiritual wisdom alongside of scientific discoveries. Otherwise, we will be in danger of imbalance. Our way of life will be too one-sided; we will be too attracted to, too dependent on technology and machinery, instead of relying on our True Self and the true world, which are more everlasting. And we are in danger of destroying ourselves if we do not have enough spiritual wisdom to handle our technological advancements." 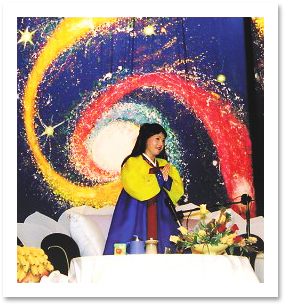 Master also said that She was very happy that the Korean people show a very great interest in spiritual issues, and came in such great numbers to the lecture -- 10,000 people that day. [Applause] Master added: "That's a lot, because you don't even know me. But I think your soul knows. Your purity tells you, therefore, you came because you are very near to God, very near to your God Nature, and you sense that you are something more than just this human physical body. So you came." The entire audience signaled their agreement with resounding applause. During the question and answer session that followed, the audience seemed sincerely curious about exploring the Truth that Master had begun to present in Her lecture. When Master announced that those interested in initiation should go to the booth outside the lecture hall, many people immediately took up Her suggestion. Also, the audience responded with loud applause when Master told them that Buddha and Jesus have tea together in Heaven, and have a loving relationship with no quarreling. Many people joined the Quan Yin family by receiving initiation immediately after the lecture. 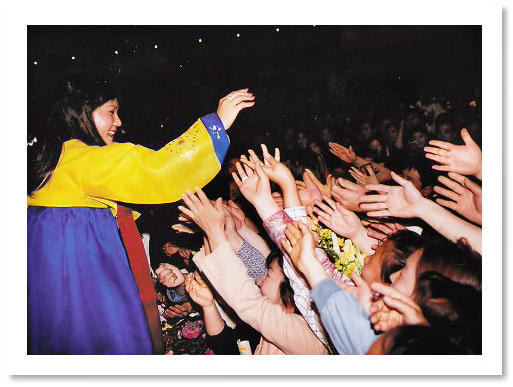 Many longing souls from various corners of the world had gathered in Seoul to catch a glimpse of their beloved Master and to receive initiation from Her on this special occasion.